Kinetics Model SRH Vibration Isolation Hangers consist of free-standing, large diameter, laterally stable steel springs in series with an elastomer-inshear insert, assembled into a stamped or welded hanger bracket. 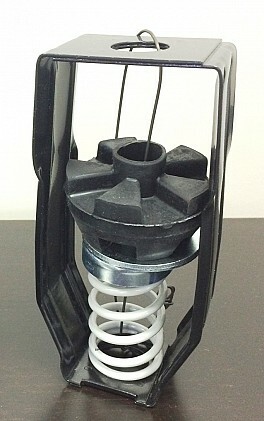 To assure stability, the spring element has a minimum lateral spring stiffness of 1.0 times the rated vertical stiffness. Springs are polyester powder coated, with a 1000-hour salt spray rating per ASTM B-117. SRH 1" and 2" hangers feature Kinetics patented No-Short spring cap. All SRH hangers incorporate a high deflection, color-coded spring element with load transfer plate and a 0.4" (10 mm) deflection elastomeric isolator complete with load transfer plate. Hangers with properly deflected coils will allow a support rod misalignment through a 30° arc without short-circuiting. Isolation brackets will carry a 500% overload without failure. SRH 1" and 2" hangers are available in deflections from 1.20" to 2.40" (30 to 61 mm), and in capacities from 35 to 3500 lbs. (16 to 1588 kg). SRH 4" hangers are available in deflections from 4.09" to 4.40" (104 mm to 112 mm), and in capacities from 100 to 3850 lbs. (46 to 1747 kg). Model SRH hangers are superior to hangers which incorporate only springs, which can transmit noise through the all-metal construction, and hangers which incorporate only pads, which can transmit low frequency vibration. Kinetics Model SRH hangers are recommended for the isolation of vibration produced by suspended mechanical equipment, low-speed suspended fans, pumps, ductwork, piping, etc. Kinetics Model SRH hangers are used to isolate suspended sources of both noise and vibration. Suspended mechanical equipment such as in-line fans, cabinet fans, and piping and ductwork in close proximity to mechanical equipment are typical uses of Model SRH hangers. Kinetics' minimum recommendation for the placement of spring hangers is that they be installed on all piping in the equipment room and on the first 50' (15 m) for piping that extends outside of the equipment room. For typical installations, the three spring hangers closest to the equipment should have equal deflection to the equipment isolators. The remaining spring hangers should have a minimum deflection of 1" (25 mm). In noise sensitive areas, the pipe hangers selected should have the same deflection as that specified for the equipment isolation and all piping in the building should be isolated. High sound transmission loss ceiling systems can be isolated by the use of Model SRH hangers in the ceiling suspension system. Model SRH hangers are available in a wide range of load and static deflection selections and can be provided with labor-saving accessories for adaption to wire or strap suspension systems, and spring may be preloaded for ease in erecting piping at a fixed elevation.